Meeting organizational needs for privileged credentials requires a coherent storage structure that is easy to use and scalable. There isn’t a one-size-fits-all answer for how to organize your privileged passwords. 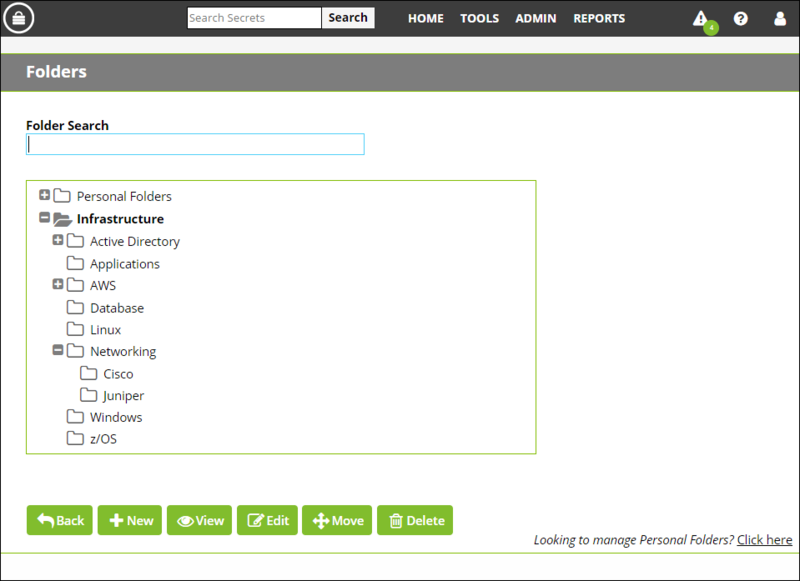 Secret Server’s customizable folder structure allows you to set up access controls based on what makes sense for your organization and your teams. different IT teams like DBAs, UNIX admins and Windows Server admins. Secret Server password management software enables you to use the familiar system of nesting Folders at multiple levels to manage passwords in a structure that suits you best. Plus, multiple IT teams can use the same central vault while having access only to areas appropriate for them—a great security feature. Assign permissions at the Folder level to make permission control of Secrets easy. This simplifies access control as teams add more passwords. Permissions can be customized on sub-folders and Secrets for more sophisticated scenarios. Each user can be assigned a default personal folder where they can keep work-related passwords, such as website logins for support sites, API keys for developers, or assigned product licenses. Folder management can be automated through the API for custom integrations with CMDB’s or IAM systems that need dynamic folder workflows.